We’d love your help. 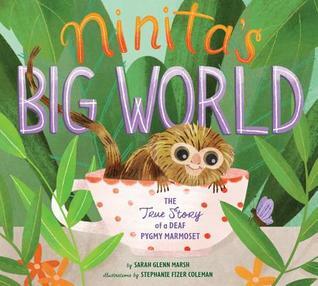 Let us know what’s wrong with this preview of Ninita's Big World by Sarah Glenn Marsh. The true story of how YouTube star Ninita—a deaf, orphaned pygmy marmoset (the smallest type of monkey)—found family, friendship, and a forever home! Ninita is the only known deaf pygmy marmoset in the world, but that doesn't stop her from making friends and chasing her next adventure! Abandoned by her parents and rescued by the RSCF, this tiny, curious monkey loves explor The true story of how YouTube star Ninita—a deaf, orphaned pygmy marmoset (the smallest type of monkey)—found family, friendship, and a forever home! To ask other readers questions about Ninita's Big World, please sign up.